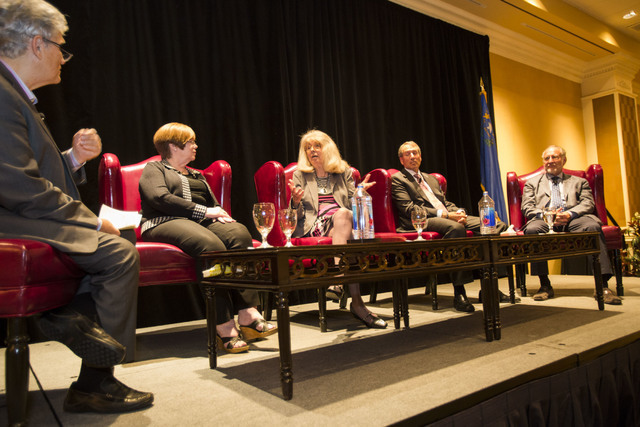 Several people involved in the emergence of major single-family housing developments and other projects around the Las Vegas Valley spoke about their personal journeys from the city’s early days to the Great Recession during the Southern Nevada Home Builders Association’s membership dinner in September. 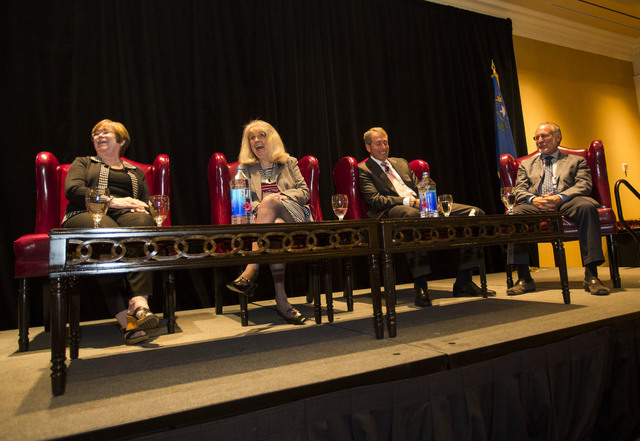 The association’s dinner, “We Built This City 3.0” at The Orleans’ conference center on Sept. 21, was headlined by Las Vegas housing power players: Mark Fine, responsible for much of the development around Summerlin and Green Valley; Cindy Coletti of Sun West Homes and Sun West Custom Homes; Richard Plaster of Signature Homes; and Elaina Blake of Blake and Associates, were present. Fine shared his history in Las Vegas, dating back to the early 1970s, when the region’s population was about 2 million fewer than today. He spent his high school days in Arizona, after his family moved to the region from Shaker Heights, Ohio, a Cleveland suburb. He graduated from the University of Arizona and received a degree in business administration with an emphasis on real estate. In 1968, Fine went to New York, where he landed a job with an investment banking firm in the real estate business. In New York, he married Susan Greenspun, daughter of Hank Greenspun. Before moving back to Las Vegas in 1973 to be closer to Susan’s family, the couple had two children. In Las Vegas, Fine entered into business with Hank Greenspun, who owned the Las Vegas Sun newspaper. Greenspun’s company, American Nevada Co., owned about 8,400 acres of land south of McCarran International Airport. 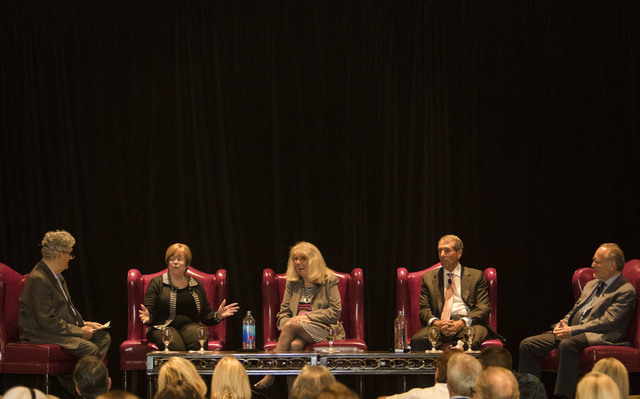 As president of American Nevada for 17 years, Fine developed that acreage into the Green Valley master-planned community. In the early years, Fine was challenged by people’s perception of Henderson as a less-than-ideal place to live and a lack of knowledge about master-planned communities. Fine worked fiercely during the next several years to change that. Fine said that once there was a viable population, it was easier for potential homebuyers to see the lifestyle they were purchasing, including neighborhoods with good schools, parks and other amenities. Starting in 1990, Fine used his knowledge of building out thousands of Henderson homes in his new position with The Howard Hughes Corp., which then started to build Summerlin. Fine has two daughters and two sons. In 2005, he formed Fine Properties with his son Jeffrey, who has had his own success developing retail and office projects and gaming ventures in Las Vegas. Coletti’s success is also a family story, as she and her son, Daniel, have had success together at Sun West Custom Homes. Coletti told of her humble beginnings in Long Island, New York, where her parents bought their first house when she was 15. In 1959, having recently married, she moved to California and, a few years later, after having two sons and divorcing, she relocated to Florida. During her marriage, Coletti and her husband dabbled in homebuilding, which allowed her to acquire skills that served her well later. Coletti said she remembers getting the results of her Florida contractors licensing exam: a passing grade was 70, and she received a 70.1. During the 1980s recession, Coletti moved to Colorado Springs, Colorado, continuing her business there. In the late 1980s, she headed to Las Vegas, where she forged a successful partnership with her son. The duo has built hundreds of custom homes in several high-end neighborhoods, including MacDonald Highlands, Mount Charleston, Canyon Vistas and The Ridges in Summerlin. Elaina Blake, owner of Blake and Associates, moved to Las Vegas in 1962 from her home state of Washington. Her story began at the Sahara where she worked as a statistical typist and secretary in the auditing department. She later moved on to the Thunderbird Motel, where she worked as an executive secretary. Her next stop was Roberts Realty, where she worked as a bookkeeper and secretary. Blake then started selling homes, in 1976. Later, she and a partner bought Roberts Realty. She sold that venture in 1989 and formed Blake and Associates. Blake said she has done several joint ventures with homebuilders. She developed several retail and office projects around Las Vegas until 2006, when the cost of land became prohibitive for the rental rates at the time, she said. Before the Great Recession, she sold essentially everything she had. “I got lucky,” Blake said. Today, she still heads Blake and Associates, but works in home sales. Another early arrival in Las Vegas was Richard Plaster. Born in a London suburb, Plaster said his family emigrated to Canada in the early 1950s and later to California. He received his undergraduate degree from Stanford University and his MBA from the University of California, Berkeley in the early 1970s. In 1973, he accepted a position with Ralph Lewis of Lewis Homes, which sent him on his path to forming a successful homebuilding business of his own. Plaster said he bought early on a 5-acre parcel from Lewis. While the plot was undesirable to Lewis, it represented the beginning for Plaster ,who later started Plaster Development, which builds homes under the Signature Homes name. During the Great Recession, Plaster said he lost his homebuilding business, but had some multifamily properties that were still going strong. Sadly, Plaster lost his wife, Wendy, earlier this year. She played a huge role in the family business, and Plaster said he is still dealing with the loss.